The Feiss Marcella very large designer 8 light chandelier in British bronze finish is supplied by Elstead Lighting and designed by Feiss. Based on the traditional bird cage, with eight upward facing double curved forged iron effect arms finished in an unusual oxidized bronze. The four leaf clover fretwork sits within the arm T-bar finial creating a daisy-chain tablet. The detail within this chandelier is immense, cast patterning to the ceiling rose, candle sconce and base finial capture the conception that nothing has been missed with both design and quality. The oatmeal beige lamp shades are hard lined and sit on taller than average candle drips. 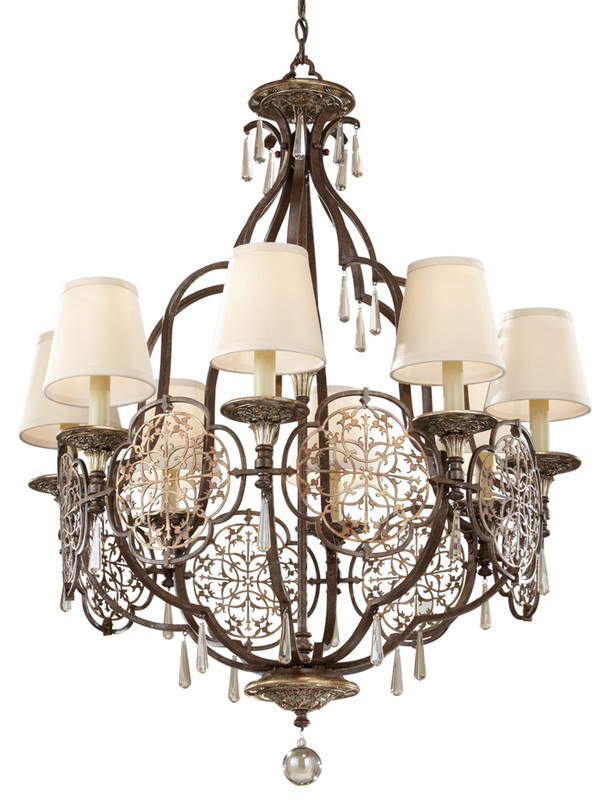 The Marcella is a large traditionally inspired designer eight chandelier by Feiss. A large single tier eight light chandelier with strong Art Deco influence. Designed in the USA by Feiss, founded in New York in 1955. 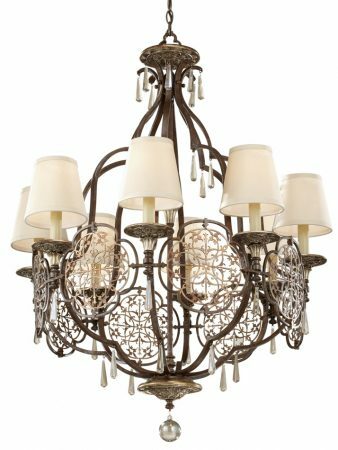 They have become well known over the years for their contemporary yet classic styling, quality and great original designs like the Marcella very large designer 8 light chandelier in British bronze finish you see here.